TEMPE – Arizona State Vice President for University Athletics Ray Anderson is setting the bar high for the school’s next head men’s basketball coach. Anderson’s remarks came after he fired Herb Sendek on Tuesday following an 18-16 season that left the Sun Devils out of the NCAA Tournament for the seventh time in Sendek’s nine years in Tempe. Anderson preached the importance of bringing in a “dynamic” recruiter and developer as coach and continued on the theme of electricity and energy. Don’t expect a delay in liftoff, either. The last time Anderson launched a coaching search was last summer, when Tim Esmay resigned as baseball coach. Just more than two weeks later, ASU announced Indiana’s Tracy Smith would replace him. Anderson was noncommittal about setting a hard time frame for hiring a new coach. Some media outlets reported on Tuesday that the job has been offered to Duke assistant and former Oklahoma coach Jeff Capel. Anderson refuted those assertions, alluding to his own history as an agent promoting clients. Anderson started the sports agency AR Sports in 1984 and worked as an agent into the 2000s. Sendek’s team was knocked out of the NIT Sunday with a 76-70 overtime loss at Richmond. Sendek was 159-137 in his nine seasons at Arizona State after coaching North Carolina State for 10 years. Various reports said that there is more than $2 million left on Sendek’s contract, but a news release from the athletic department said outside sources will help pay out the remaining amount. The reaction to the change from Arizona State fans and students was hardly one of surprise. Arizona State junior Paxton Carrasco echoed Womack’s sentiments. Not all students were pleased to see a shake-up, though. Patrick Carlson, a sophomore and executive member of the 942 Crew, Arizona State’s student section, said he would support ASU’s decision but was sad to see Sendek go. Anderson said that he met with the men’s basketball team earlier Tuesday and told them he felt their best interests were being served by moving on from Sendek. Arizona State men’s head basketball coach Herb Sendek was fired Tuesday morning, less than 48 hours after the team’s season-ending overtime loss to Richmond in the second round of the NIT. Sendek was 22 games over .500 in nine seasons as the head coach. ASU Vice President for University Athletics and Athletic Director Ray Anderson said it was time to upgrade the program. 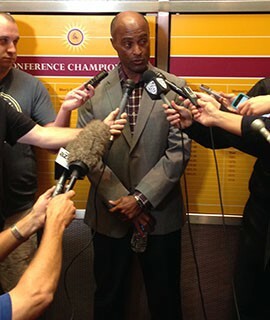 Arizona State Vice President for University Athletics and Athletic Director Ray Anderson addresses the media on March 24, 2015, following news men's basketball head coach Herb Sendek has been fired after nine seasons. The Sun Devils' season ended Sunday after an overtime loss to Richmond in the second round of the NIT. Ray Anderson, Arizona State vice president for university athletics and athletic director, has high expectations for the school’s next head men’s basketball coach.